Gili Air Hotel is a tourist resort located on the sea, which rises onto the small Gili Air atoll. 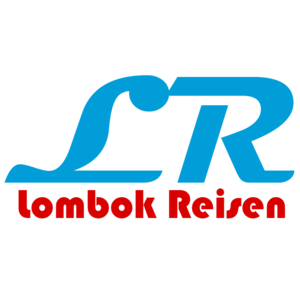 In Indonesian, Gili Air means little island of water, and Gili Air is one of the most beautiful islands in the world, just 5 km from the “mother” island of Lombok, in central Indonesia. The relaxing atmosphere provides an excellent way of “de-stressing” for those who wish to distance themselves from the frenetic life of the city. This holiday will make for an unforgettable experience! The resort extends over a surface area of approximately 35,000 m² and consists of a central body, where the front office services, restaurants and offices are located. The Standard rooms Pretty traditional Indonesian style traditional Indonesian style rooms, with characteristic open-ceiling private bathroom. Excellent for those who wish to have an unforgettable holiday, with bedek walls and wooden flooring, and also available with a sea and front pool view. Room Facilities: Hot and cold water, Cooling fan. Brick-built, air-conditioned rooms, with private bathroom, for those who wish for an extremely relaxing holiday and available with sea or garden view. Room Facilities: Hot and cold water, Air conditioning, Mini bar and Satellite television. Room Suite Room, Brick-built, two-room suites. Spacious and comfortable. Available with partial sea view. 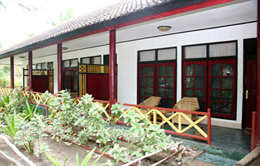 Room Facilities: Hot and cold water, Air conditioning, Mini bar, Satellite television. 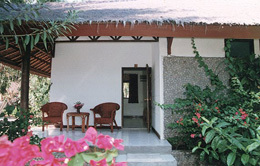 Luxury Room, Newly built, spacious and comfortable rooms with sea view. With private bathroom. 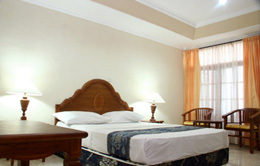 Room Facilities: Hot and cold water, Air conditioning, Mini bar, Satellite television.